Colourful buildings on the shores of Lough Derg at Killaloe, Ireland. Shepherds guide their flock, Uçhisar, Turkey. > Throughout my career I looked for inspiration in the search for a special image. I studied, with an inquisitive eye, the old master's work and many published images. I gave myself projects to shoot, sometimes restricting my use of lens to a super wide or long lens or a specific theme like reflections or back-lighting, to unearth things I had missed. > Recently, I watched a documentary on Vivian Maier, the Chicago nanny who shot hundreds of thousands of amazing images that were found packed away in boxes after her death. There was inspiration in her work. It had me itching to make a nice black and white image. 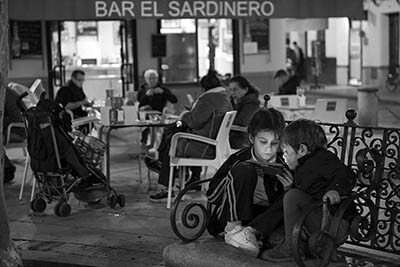 > On a trip to Spain and Portugal recently, I assigned myself a project to shoot street scenes in black and white. I had more fun than I have had with a camera in a long time. My friend and great Canadian photographer, Ted Grant, liked to say, "real photographers shoot black and white". I am not going to take a stand on that but I can say I had a great time going back to B&W! > I have posted some of the images in the "Iberia in Black and White" category. Have a look. ORANGE CITY, Florida—The pontoon boat meandered down a back channel of the St. Johns River through Blue Springs State Park, 54 kilometres north of Orlando. Alligators on the shore basked in the cool morning sun.